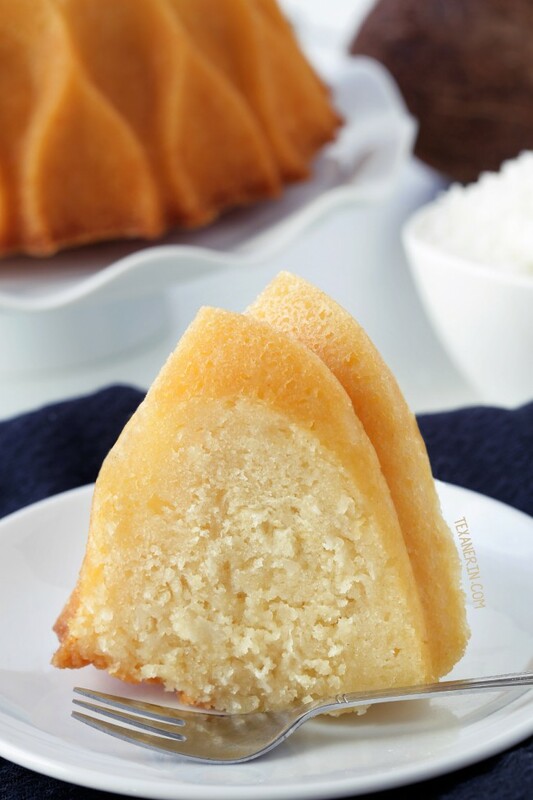 This super moist coconut rum cake is soaked in a coconut rum syrup and has all-purpose, gluten-free, whole grain and dairy-free options. Thanks to Nordic Ware for making today’s post possible! Like I mentioned in my Apple Bundt Cake recipe, I used to have some serious issues with Bundt cakes sticking to the pan. It got to the point that I was afraid to even make them. Then I bought this Nordic Ware 60th Anniversary Bundt pan and all my Bundt woes went out the door! Since then, I’ve bought some other Nordic Ware pans and I love them all. Nobody makes Bundt pans as well as they do! I’m so happy to have Bundt cakes back in my life because I don’t do layer cakes. For this non-decorator, they’re such a hassle and never come out looking like I hope. 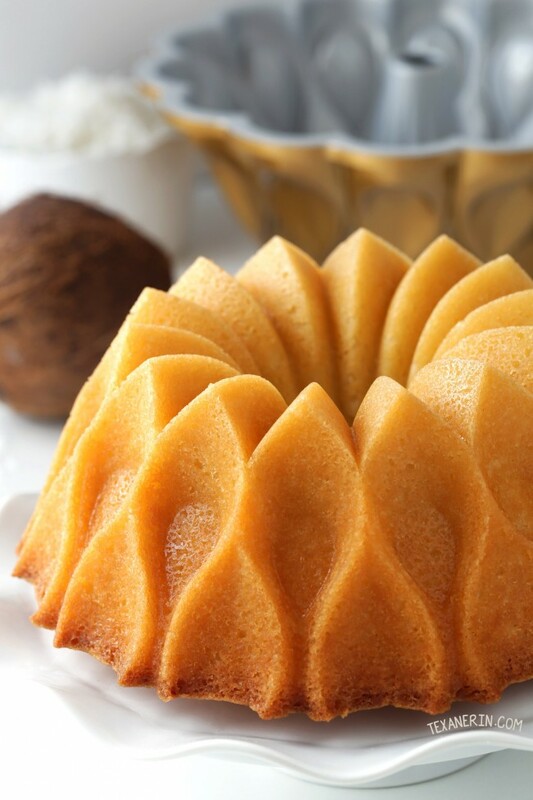 Bundt cakes, though, are ridiculously easy and always turn out beautifully! 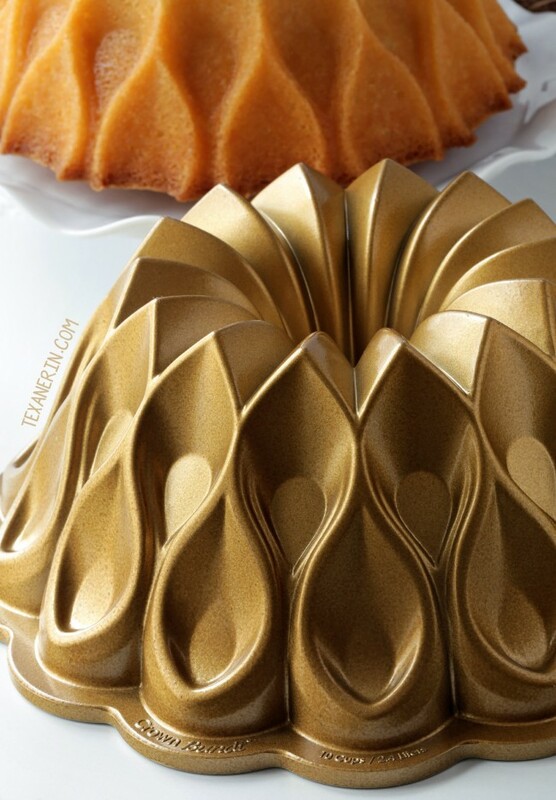 Nordic Ware recently sent me their stunning Crown Bundt, which is a new and exclusive Bundt design produced for their 70th Anniversary. It expresses the essence of their proud Scandinavian roots and pure elegant design by combining old world patina with bold and beautiful panache. It’s one of three new pans in their 70th Anniversary Collection, all of which feature a never seen before gold-metallic finish. It’s such a show stopper! I actually gasped when I took it out of the box. And I haven’t put it up yet. It’s just too pretty to be hidden away! Nordic Ware has been making high-quality kitchenware in the US for 70 years. With their huge variety of collections and hundreds of products, Nordic Ware has also become known internationally, with millions of fans around the world. We even have them here in Germany! Does anyone else have a hard time passing by their Bundt pans in kitchen stores without buying one?! I know I do. And even after all this time, they’re still a family owned and operated company. Along with the new collection, they’re launching contests and other events throughout the year to celebrate! Be sure to follow Nordic Ware on Facebook to be kept up to date. When I first saw the Crown Bundt, I knew that I had to make something without any kind of frosting or glaze that would just detract from the gorgeous shape. I originally wanted to make a Scandinavian-inspired cake and decided on lemon cardamom. It was good but not mind-blowingly delicious. So I kept at it and came up with this Coconut Rum Bundt Cake! I first made this recipe as cupcakes and they were great. I was almost tempted to skip the coconut rum syrup. But I had gone to the trouble of getting the coconut rum so I tried it and yup – it was a definite improvement! For the gluten-free version, I used this 1-to-1 baking flour. Hot from the oven, you can notice a textural difference but nobody could tell a difference between the two versions once the gluten-free version had cooled! I have to admit that I was pretty scared when it came time to turn this cake out onto a plate. After years of cakes falling into pieces, I suppose it’ll take time to get over that. But this Coconut Bundt cake came out just as easily as with my other Nordic Ware pans! I’ve made rum cake before, but this coconut rum cake recipe is totally different. Except for the syrup, which I adapted to use less sugar and coconut rum in place of regular rum. In contrast to the rum cake, you can’t taste the alcohol all that much. It’s much more subtle here! If you want more of a boozy taste, perhaps you could try a mix of coconut rum and regular rum. If you only use rum, you won’t be able to taste much coconut at all (I know because I’ve tried!). The coconut rum syrup uses butter, but for the dairy-free option, you can use dairy-free / vegan butter or coconut oil. I have to admit that I preferred the butter version over the coconut oil version. There’s already so much coconut flavor so the butter was a nice addition! If you want you could skip the syrup all together. While the cupcakes were nice and moist without the syrup, I haven’t tried the Bundt cake without it but I’m assuming and hoping it’d also be nice and moist. 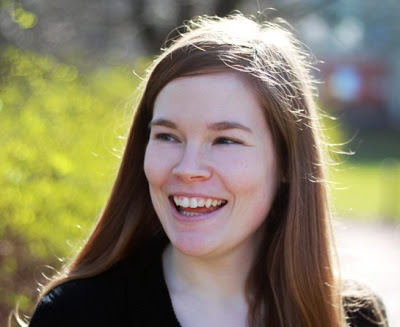 I’ve mentioned this before, but I was an exchange student twice in Sweden and I’ve gone back there and Iceland, Norway and Denmark about 15 times. I guess you can say I love Scandinavia? ;) The Crown Bundt just screams Scandinavian design and I seriously adore it. Even the cut pieces are pretty! Thanks again to Nordic Ware for sponsoring today’s post! As always, all opinions expressed are my own. Preheat your oven to 350 °F (176°C). Brush the pan with solid vegetable shortening and dust with flour or use baking spray with flour in it to grease the pan. In a medium bowl, combine the flour, baking powder and salt. Set this aside. In a large bowl, mix together the sugar, melted coconut oil, eggs, coconut milk, coconut rum, vanilla and coconut extracts until well combined. Fold in the flour mixture, just until no more streaks of flour remain. Fold in the coconut flakes. Pour the batter into the prepared Bundt pan and bake for 40-50 minutes, or until a toothpick inserted in the middle comes out clean. The cake will crack around the top - stick the toothpick into this area to test. Let the cake cool in the pan for 10 minutes and then invert onto a wire rack. While the cake is cooling, prepare the coconut rum syrup. In a large saucepan over medium heat, heat the butter, water, sugar and salt until the sugar has dissolved, stirring occasionally. Take the saucepan off the heat and stir in the coconut rum (it'll bubble). Wash and dry the Bundt pan and place the cake back into the pan. Poke holes into the cake (I used a meat thermometer to do this), about every 3/4" or so. 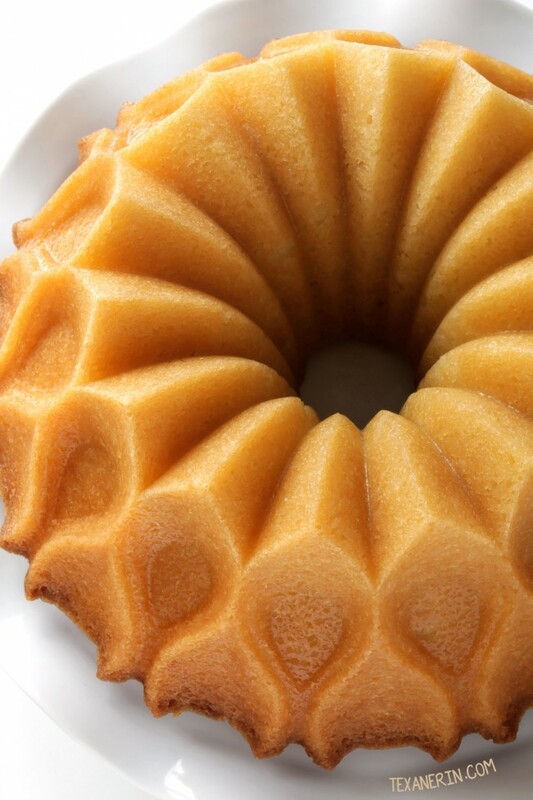 If using the Crown Bundt, make sure to poke your holes at an angle instead of poking straight down. Pour the syrup slowly over the cake. It will look like WAY too much syrup but don't stop pouring! It will get absorbed. Let soak for 2 hours and then invert the cake back onto a serving platter. Cover and store at room temperature for up to 3 days. General tip: if you have issues with the syrup-drenched cake not coming out of its pan, place the Bundt pan in a large bowl or pot. Very carefully fill with very hot water, but make sure that no water gets in the pan. Or you can fill a pot with hot water and submerge 2/3 of the pan in the water and hold it there for 30 seconds. The heat and steam will help loosen the cake from the pan. If it doesn't plop right out, give the top of the pan a good whack. Let the cake cool completely. Cover and store at room temperature for up to 3 days. 54 comments on “Coconut Rum Cake (gluten-free, dairy-free, whole grain options)” — Add one! SO IN LOVE with this bundt pan! it is so beautiful and the recipe looks scrumptious – can’t wait to try it! I’d like to try this, but am not sure I want to invest in a bunts just yet. Would I be able to use a regular cake pan, or even a rectangle and just leave the cake in it? You could probably use a 9″x13″ but I have to say that I have absolutely no idea of the baking time. You normally bake cakes that size 20-45 minutes. I’d love to hear how it comes out if you try it! Very delicious recipe. I used a gluten free flour substitute, and it definitely did not want to come out of the pan, no matter what I did. Next time, I’ll be putting this in mini silicon bunt pans. For now, the cake pieces are going into a Christmas trifle. I’m so terribly sorry for just now seeing your comment! I didn’t realize I wouldn’t have internet at my in-laws over the holidays. :( I’m happy to hear that you liked the cake! 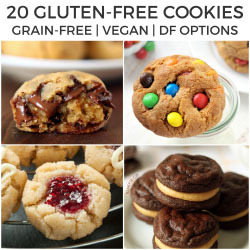 Which GF flour sub did you use? I hope next time will go better! Thanks for your comment and sorry again. I know this is two year old posting however it is new to me. Looks delicious. Any suggestions on egg replacement? I can’t have egg yolks. Thanks in advance. I welcome comments and questions, no matter how old the post is. :) 4 eggs is quite a bit to replace with the egg replacers I normally use (chia eggs and flax eggs). Have you ever tried Ener-G Egg Replacer? I haven’t but have gotten a lot of comments about people using those (but not on this recipe). Sorry I couldn’t be more of a help! Can you tell me if the coconut milk in a can is full fat or light? Seems so heavy if full fat but you don’t really say. Since you said can I am assuming not coconut milk from the dairy section. I’m so sorry for just now seeing your comment! I used canned coconut milk – the regular full-fat kind and not a light variety. The cake isn’t heavy or dense with the coconut milk but if you want to use light, I’m guessing it’d probably work. I’m making this for my birthday and I’m wondering if you have ever thought about a pineapple frosting or topping of some sort? If so do you have a recipe? Why do you wash and dry the pan before putting the cake back in? To make sure that there’s nothing left in the pan for the cake to stick to when you put the cake back in and add the syrup. I’ve had that happen a few times! Thank you!! I would usually risk it but not with such a beautiful shape!!! You’re welcome! And I agree. It’s not worth risking over 2 minutes of cleaning. :) Hope you’ll enjoy the cake! Oh how I love that Bundt pan! I have quite a collection but you can never have enough! The cake looks beautiful too! Yay! I’m so happy that it came out well for you. :) Thanks so much for your feedback! Sorry The “Crown” pan looks more like an Elizabethan Ruff Collar to me then a crown. I still like it. This cake is just stunning! I would’ve been losing my ish at the flip moment praying it would come out without issue with this design but you nailed it! I can’t get over how moist and amazing the center of the cake looks too. Bundts are my favorite celebration cakes. They’re simple and yet always so flavorful and the best part, don’t require fancy decoration. Saving this one for the next celebration! I was definitely nervous! I’ve never been so thankful to hear a cake plop onto the plate. :D I hope you’ll enjoy the cake if you get a chance to try it out! I am also a non-decorator when it comes to cakes. I always try to play it cool and be all “Oh no I was going for the rustic look” but really I wish I could make it look professional. But I was not born with those skills so I’m learning to accept that…haha. Now, give me a bundt and I’m a happy girl. I have heard so many good things about Nordic Ware pans that I think I need to invest. There is nothing more terrifying than that moment you flip you a bundt! Oh and not only is this flavoring amazing (coconut AND rum!) but that bundt design is a total showstopper! I hope you will! They’re absolutely worth the money. I normally buy the cheapest pan (or whatever) with great reviews on Amazon but that didn’t work out so well for me and bundt cakes. I’d heard so much about Nordic Ware so I spent more than I’d have spent on a cheap junky one, but seriously… so, so worth it! I’m always scared to make bundt cakes too. I always make amazing flavors and then they get stuck! last time Thomas forced it out and the cake broke into 1000 pieces. I’ve always loved the look of the Nordic Ware pans though, I just never forked over the money to buy one. That Crown Bundt (and cake) is beautiful! Haha. Aww. Bundt cake flipping over used to be a 2-person operation over here, too. It was SO stressful! Seriously – you have to get yourself a Nordic Ware pan! My success rate has been 100% with them and my IG account used to be full of bundt cake fails. What a stunning cake!! LOVE the pan!! That’s probably the single most beautiful bundt I’ve ever seen – that design is stunning. And the cake itself….gah….amazing! I love how moist and rum syrupy it is! I’ve been seeing this beauty all over social media today – I absolutely LOVE IT! And those flavors are just BE.YOND! I can’t use even gluten-free flour…could you use an almond/coconut mixture of flour in this cake? Almond flour and coconut flour aren’t really interchangeable with other flours so I’m afraid that wouldn’t work. I’m sorry! I tested this cake with three different types of flour but unfortunately didn’t try a grain-free version. It’d probably require reworking the recipe but I loved it so much that I may attempt a paleo version down the line. WOWZA! That pan could make even the simplest cake a show stopper. I heart rum cake, and the coconut addition sounds perfect for summer days ahead. Right?! That’s what I love about it. I am not a decorator! Oh my gosh, what a gorgeous pan!! And coconut rum, WHAT?! Sign me up! This cake is such a total stunner! Amazing flavors, and that super-cool pan just molds it all into the most fabulous shape! A total showstopper that would be the standout hit at a potluck or even a ladies’ brunch or Mother’s Day tea! So special! Thanks, Shelley! I agree. This pan is just so beautiful! It has been ages since I have had a good rum cake! This looks amazing! I just love the style of this cake pan, it is so fun!